This weekend marked the kickoff of the League Championship Series’ spring split playoffs, and in the European region, top team H2K finally met its match against a revitalized Fnatic. H2K was a clear favorite in today’s match, with a 10-3 record for the season compared to Fnatic’s 6-7. Having beat Fnatic 2-0 in regular play, H2K seemed to be on autopilot for the draft of game one until a surprise Camille pick threw the team off. Fnatic’s Jesse “Jesiz” Le picked up the traditionally top-lane champion to support Martin “Rekkles” Larsson in the bottom lane, who was playing a strange pick of his own in the sewer-rat marksman Twitch. Fnatic’s players all boast wide champion pools, and this flexibility threw H2K for a loop in game one as the team clicked on seemingly off-brand picks. Fnatic secured the game one win, and put H2K on its back foot. Sticking to its guns, H2K kept with the plan and banned Fnatic’s more potent pocket picks in Shen and Kennen, while opting for an additional ban on Larsson’s Twitch. For his pick, Larsson would turn to another off-meta champion in Vayne, but it was Fnatic’s middle lane player Rasmus “Caps” Winther that would cut a highlight reel in game two, starting with an incredible play for first blood. Reading the movements of H2K and flashing into the bomb plant they would use to escape, Winther secured the early kill. 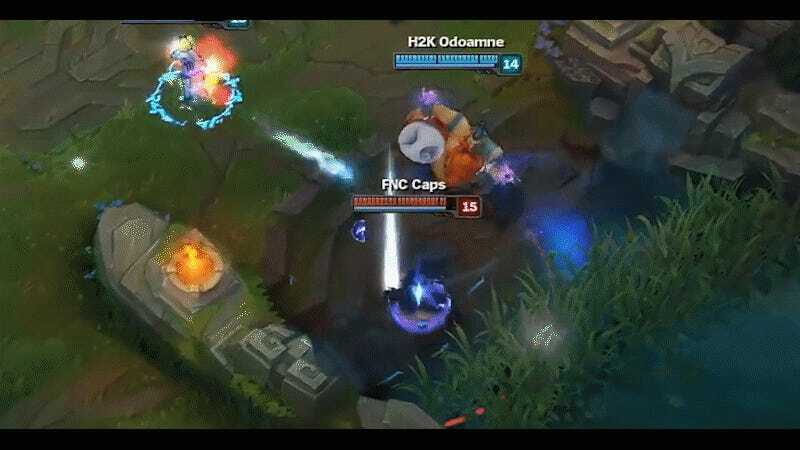 Later, he would make another massive play, utilizing Ryze’s teleportation ultimate to narrowly avoid a massive collapse on the mid lane from H2K. Securing the game two victory, it was clear that the 6-7 regular season Fnatic had been usurped by a driven, aggressive squad. H2K was staring down the barrel of a clean sweep, and in the draft of game three made a small but egregious error: allowing Kennen and Shen through the draft. Larsson took the former while Paul “sOAZ” Boyer took the latter, and with Le on a second round with support Camille, Fnatic made quick work of game three. The final map is best summed up by this GIF of a futile escape attempt from H2K’s Fabian “Febiven” Diepstraten, as Fnatic closes in on him, Winther slowly encroaching on the player with the rotating orbs of Aurelion Sol as a 26-6 kill line hovers overhead. In three games, Fnatic secured the upset and announced itself as a force to be reckoned with in the European playoffs. Games will continue throughout April, as Fnatic gears up for its coming match against the most winning team in the region, G2 Esports.